An amputee wearing the DARPA-funded “Modular Prosthetic Limb,” shakes hands with a fellow attendee at the Federal Advanced Amputation Skills Training symposium in Arlington, Va., in July 2014. An amputee wearing the DARPA-funded “Modular Prosthetic Limb,” shakes hands with a fellow attendee at the Federal Advanced Amputation Skills Training symposium in Arlington, Va., in July 2014. Photo by Randy McCracken. Fred Downs is a bit of an anomaly. An infantry Veteran of Vietnam, he’s more Andy Griffith than Robocop. It’s easier to imagine him telling the grandkids a story than demonstrating space-age technology in front of a room full of clinicians and researchers from VA and the Department of Defense. But that’s just what he was doing in early July during a three-day symposium at the VHA National Conference Center in Arlington, Va. The event, titled “Federal Advanced Amputation Skills Training (FAAST),” was sponsored by the VHA Employee Education System, the VHA Office of Rehabilitation and Prosthetic Services, and the Department of Defense. 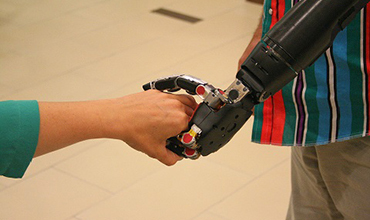 For more on the Modular Prosthetic Limb see the article from VA Research Communications.